Good Morning and Happy Fall! I can finally say that today because really...it just now feels like fall here in Dallas. I have to cut back after that cruise last week. These cute napkins made their way home from HomeGoods the other day. They sure know how to tempt us there. 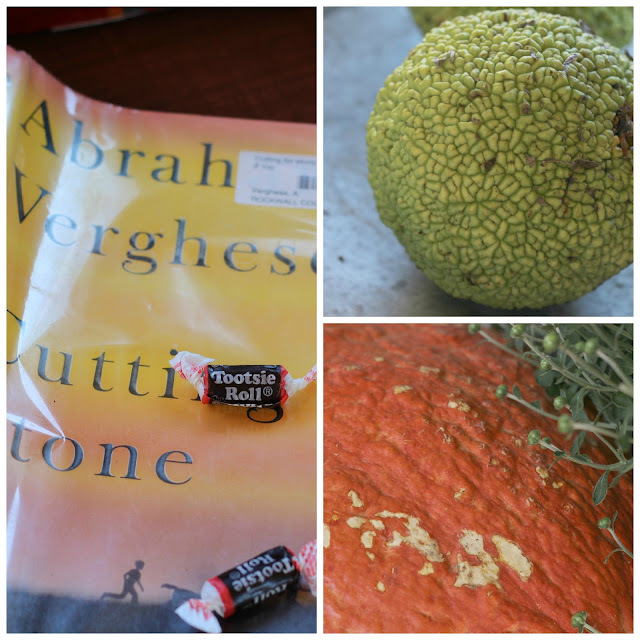 When I think of fall, I think mostly of what happens in the kitchen and what happens outdoors. In our kitchen, yummy recipes reappear that we haven't made all summer. Chili, stew, and pot roast are so delicious! The art work on the kitchen counter changes seasonally. This time I framed a free printable that was provided by Ann at On Sutton Place. Over on the kitchen table, I did a little vignette quick change. I didn't complicate things and tried to use what I already have. Did you know a nest can look fallish? Well sure if the colors are right! book that I'll tell you about in a few days. The weather is absolute heaven all the sudden. Let's go out and I'll show you my hang out. gigantic mums for $15.00 each!! I said YES PLEASE and marched out of there with four of them. Can you blame me? No flowers yet but hundreds of buds to look forward to. 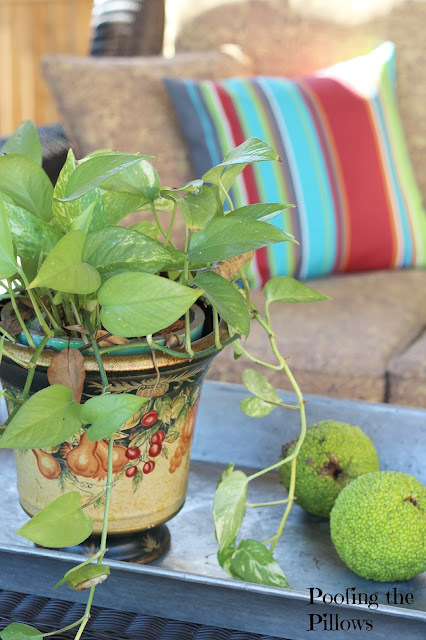 On our patio table we have a galvanized tray that usually holds a plant and a drink. We picked up some horse apples out in the greenbelt. Have you seen these before? This afternoon we planted a few cool weather plants. Pansies and alyssum will live all winter here. If you'd like to see more of our home you can click here. I hope you'll go visit these other talented ladies. Just click on their names to be taken to their post. Thank you Michele at Shelstring for organizing us. What a lovely home you have. I agree about HomeGoods always so many things you just have to buy when I go. Here in PA we call horse apples monkey balls. They look great for fall decor. I'll have to remember them for next year. And, I am so surprised at how many of us on the tour have very similar kitchens. White cabinets and a very similar granite top. I did not share my kitchen this time but wish I had so you could see. What can I say, Great minds think alike? or just kindred spirits. Pretty! Your home looks warm and ready for Autumn. Beautiful potted plant on the front porch and outdoors is the right place for those horse apples. I once gathered some and put them in a basket in the dining room. I had to get up in the middle of the night and put them outside, they had a smell that just permeated the house! 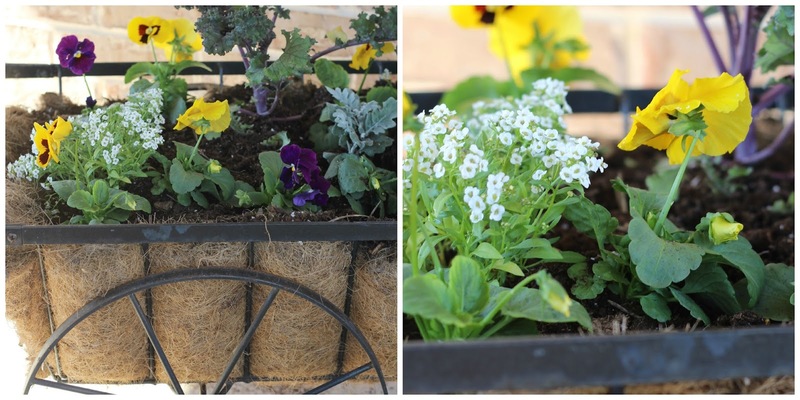 Lucky you, your flowers last all winter! 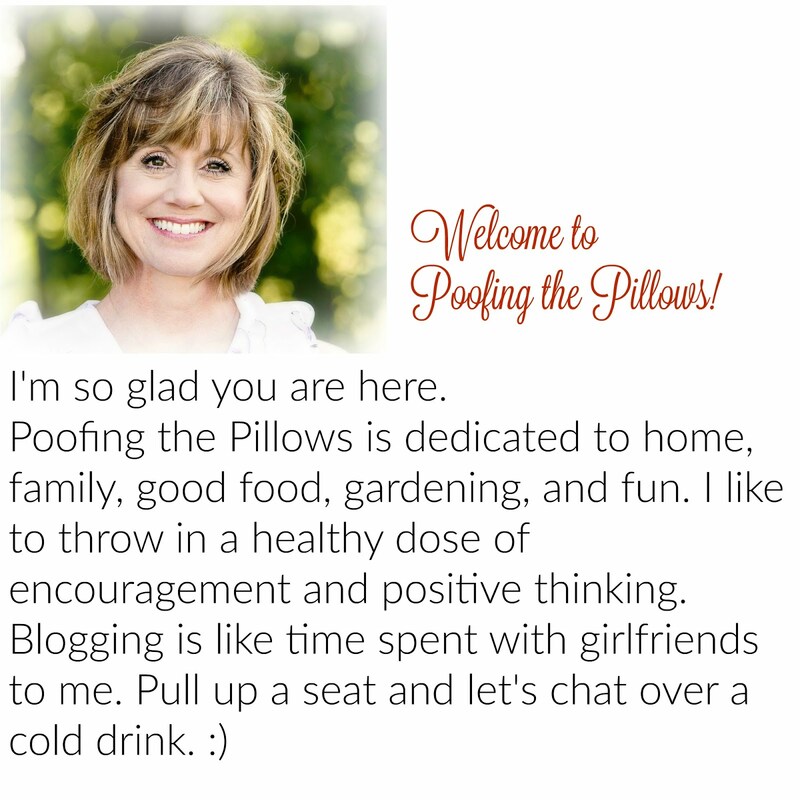 just found your blog !i love it so far! Everything is so festive and pretty. You are definitely getting into the Fall spirit. The mums are gorgeous.....they just make me smile. Hello Stacey! Your place looks lovely in fall, as it does all year round. Thank you for showing me how you decorate with the horse apples. I am still very intrigued. They are very, very cool and their color is perfect for the season, rich and bright. I bet your mums are going to be fabulous in a few days. Can't wait to see what color they are. Of course for all of your pretty, the thing that caught my eye the most, was the Tootsie Roll! It reminds me of trick or treating ~ yum!! 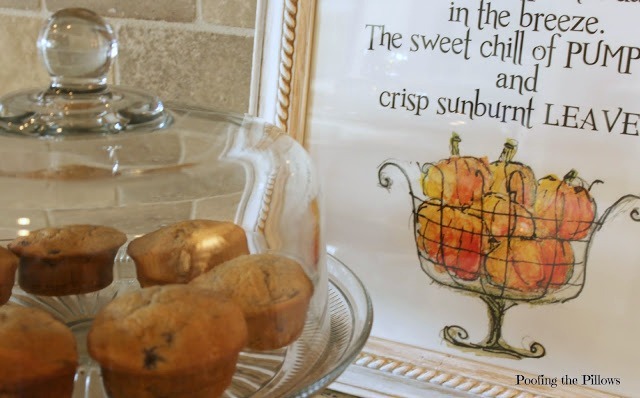 Hi Stacey, love your fall touches~~ Your kitchen is so cozy and really inviting to spend time cooking those autumn meals. We do the same here and love a good chili, stew and soups. Your outdoors is just as inviting and what a steal on those mums. I would have snatched those up too. It will gorgeous when in full bloom. It's loaded with buds. Love the weather we are enjoying finally. Cool nights and mild days. Oh so welcomed!! Love it all Stacey! Especially that sweet nest! And your perfect teakettle! Beautiful! I am so excited about our cooler temps! My favorite month, favorite season and loving being outside. I agree about enjoying soups, stews and more! Your kitchen is so warm and inviting. Can't wait to see the mums in bloom ~ they are awesome! All lovely and mums just coming into bloom are the best...they'll last throughout the season. Your Fall plants are all so pretty! I have always loved pansies and have forgotten about planting any this season. They are one of my favorite flowers. Your mums are huge too. I know you are anxious for them to bloom. That was a great price. I used to have some of those "horse apples" that were fake. I don't know if I still have them or not. They are fun to decorate with. Pretty neat that you have the real thing! Aren't they called osage apples? I can't remember but they have a name similar to that I think. Everything looks beautiful! 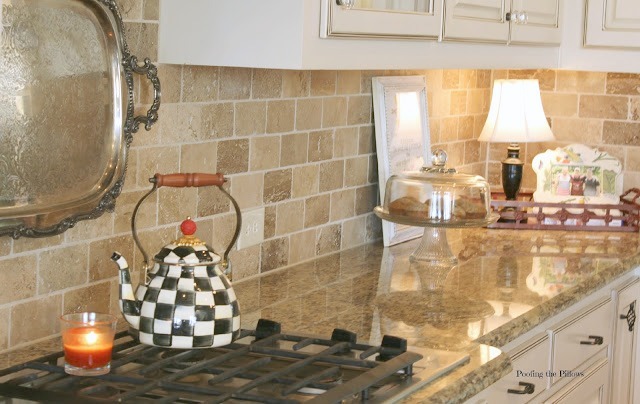 How did you attach the silver tray to your tile backsplash? I would like to try that. Nice to see your fall cozy spots! Beautiful kitchen countertops!!! I have fallen in love with your silver tray hanging over the stove!!! No...I don't blame you for getting the mums...they're ready to pop with color!!! BTW...I go back to AZ on the 15th, and I'm so glad to hear from my peeps that it finally has cooled down...phew am I glad!!! I love the simple and creative ways you have brought Fall into your home. Thanks so much for inspiring me. 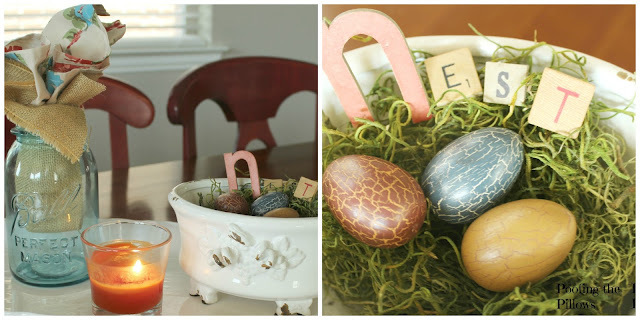 I'm stopping in from the blog hop! Everything looks great! Your kitchen is beautiful! Stacey, your home looks so lovely! 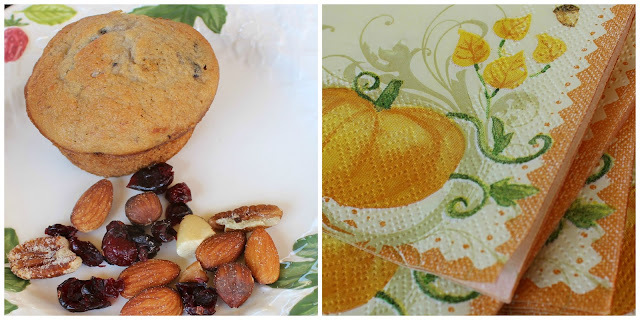 I love the vignettes, the printable and you are so right..it is time to start making those things we have been without all summer....those yummy fall dishes of chili, stews and roast....LOVE your kitchen and so glad to know we share the love of cute napkins from HomeGoods! Hugs!! Your home looks so warm and cozy, Stacey, for fall! I just love all of your special touches for the season. Glad you're enjoying some cooler temperatures. It looks so cozy, Stacey...the mums will be stunning! I am loving your vignettes! The muffins look relish. I love your light on the counter. It adds a nice warmth to your kitchen. I appreciate all of your book selections. I recently started 3 different books chosen at random and after an hour in gave up on each one. From now on I am going with "recommended" books only. Hi Stacy. I love the touches of fall you have added to your home. It finally feels like fall here too! Loved your tour, and your kitchen is so pretty, love the little lamp, and this time of year it is so nice to have a little light on or a candle...it makes everything so cozy! Your home is beautiful! Soooo beautiful! 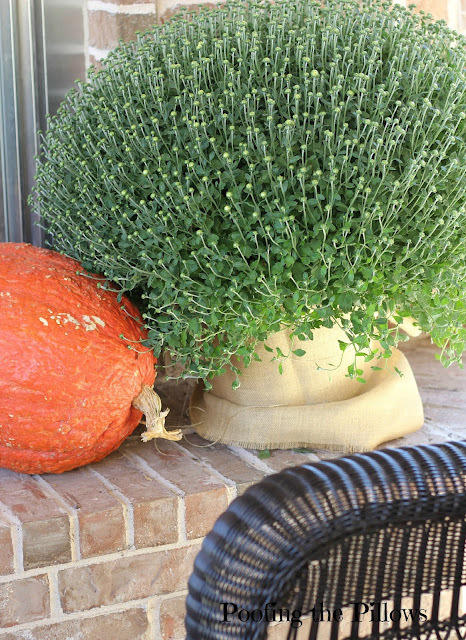 Love all the fall touches around your home. From the napkins to the mums, all of it is gorgeous. Pinned and shared! I enjoyed my visit in your home via your blog!! And I love a lamp on the kitchen counter, too. Makes everything cozier, right? Your fall decor is lovely. It's fun having you on the fall tour of homes - thanks for sharing! Wow those mums are huge! What a deal! Beautiful porch decor. I love your fall touches! Those giant mums were such a great deal and they make such an impact too! The slightly cooler weather in Texas is a true blessing, although I see some people wearing sweaters and I don't know how they don't pass out! Your home is beautiful Stacey. I love your lamp in the corner of your kitchen counter it warms up the whole space. I love all your flowers especially your mum I'm sure it has many pretty flowers on it by now. Thank you for sharing your lovely home! Yes...that is a huge mum! I would have said yes also. Thank you for including me in your list of Inspiring friends!